Cabinet and furniture half surface hinges are used when one leaf is mortised into the cabinet door frame, and the other leaf is mounted on the surface of the cabinet door. Constructed of solid brass in your choice of handsome finishes. 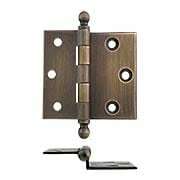 Reproduced from a circa 1900 original, these handsome half-surface hinges are a House of Antique Hardware exclusive. Authentic to the last detail, they feature loose pins and slotted ball tips. Beautifully made from solid, extruded brass.